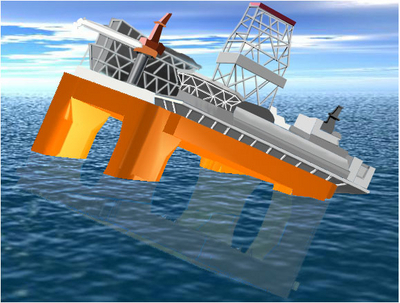 Autoload- rig version is developed for the specific need for Semi Submersibles offshore rigs stability analysis. Checking of Stability in any direction with true shift of slack tanks also in any direction is of great importance. Rig stability is very different and more complex then ship stability. A loading computer developed for traditional ship stability will only cover transverse stability and should not be used onboard a rig. The huge variations of water plane area, combinations of maxvcg curves for different operation modes, check of intact and damage stability and wind in any 360 degrees direction, and constant control of deck load margins relative to operation and survival maxvcg curve and draft is all taken care of with Autoload rig version. This gives a first class tool to not only monitoring and record daily conditions, but also to simulate any ”what if” situation, like combination of damage, wind from worst direction, break of mooring line, deck edge in water, … any possible scenarios. The autoballast function suggests ballasting of selected tanks to bring you back to target draft /heel / trim. Coastdesign Norway has 25 years of experience with rig stability. All major rig designers like Aker and GVA have been using Autohydro for more than 20 years for rig design and stability analysis. Autohydro and Autoload share the same mathematical engine. 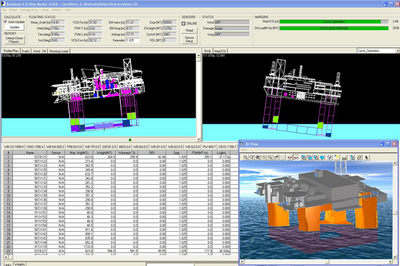 By choosing Autoload loading computer, the 3D rig database is simply moved from design office and onboard the vessel. This ensures a fast (overnight if urgent) delivery, and Autoload is available from preliminary stability all the way to final approved stability. For new rigs this is of great importance, it gives marine operators and other technical staff the possibility to get to know the rig and try out what if situations long before the rig comes into operation. One of our latest Autoload installations “Gjoa”, Statoil’s new production rig in the North Sea. Vessel 3D database are made by Aker Solutions. When they update the model in Autohydro during design, the same model is used for updating Autoload. No delay. The Screen interface is designed to give the operator a full overview of the vessels status due to current stability, vessel loading, and reserve capacity. Red bars will give a clear warning if any margins are exceeded. Profile, body and plan and 3D view show vessel floating position as well as tank loads and fixed weights. Maxvcg curve with margin, Deckload margins, VDL, wind, mooring loads, auto ballasting -, etc. are readily available from the main user interface through a selection of tabs. The Autoload screen interface is a result of more than 20 years of experience with Windows programming and design of true windows application, always using the latest available programming tools on the market. Handle intact and damage stability in any direction. Maxvcg window with selectable Maxvcg curve, show restricted /allowable area and current condition including free surface correction both transverse and longitudinally. Compare corrected vcg for weakest axis with maxvcg curve. Monitoring the Deckload margin both for operation and survival condition /draft. Bars and alarms for most critical data due to rigs safety, like maxvcg margin and deckload margins. Permits different sea water densities. Mooring dialogue window, with user. Or sensor input. Calculate all mooring weights, like tension, weight of chain onboard and anchors on bolsters. Ballast sequence planning window with report and replay of steps. Automatically ballast calculations, based on user input target floating position. Connect to on-board tank and draft sensors, also sensors for winch tensions, chain paid out, wind, risers, and any sensors available in vessel IAS. Correct tank volumes calculated in vessel 3D tanks with current heel and trim, based on pressure sensor input from IAS. One license of Autoload for a specific rig can be installed on unlimited number of computers onboard and onshore, with exchange of loading data. (For emergency response and redundancy)… with no extra cost. Create readily printable reports, can be exported to Microsoft Word. Autoload can either be fully integrated into the vessel control system or receive sensor data via standardized communication protocols , for tank loads, draft, mooring loads, chain paid out , (chain in lockers), risers, wind or any vessel load measured with sensors. When on-line, all sensor data are automatically updated to reflect real conditions. Autoload can be installed on any computer using the Windows platform. For optimum performance, we recommend that the computer specification should be at least: Pentium 4, 3GHz with 512 MB go RAM, 100MB free disk space, 128MB video card with Open GL support, DVD/CD reader, USB port, serial port, Ethernet card. Internet Explorer version 4.0 or later is required. Operating system: Windows XP, Windows 2000, Windows Vista or Windows 7.